3 Day music festival in aid of The Whitechapel & The Basement Advisory Centre. Following the success of the first ever HOPE Fest in March, HOPE FEST: The Big one, in aid of the Merseyside’s homeless, will feature eighty bands and be held over five venues in three days which are The Brink, The Lomax, The Magnet, The Baltic Social, The Albert Lark Lane. “The reasons why people become homeless are complex at The Basement we provide support to empower people to address those issues – This work cannot be done without fundraising, for every coat, t-shirt or pack of new underwear given through Hope Fest, people will not only get to see great artists and bands but they will also be helping someone in Liverpool create a new life for themselves, away from homelessness”. The event will kick off at 6pm on Friday 19th Sept at The Brink with The Soul Rays headlining that night. The Soul Rays are a 10 piece funk band from Liverpool. With ferocious horns, and a 3 piece lead vocal group they are designed to get people dancing. Off the back of an amazing support slot with New York soul sensations Myton & E, The Soul Rays are ready to go at it full speed at their second visit to Hope Fest. They will be supported by Last Heart, Eleanor Nelly and many more! The Brink will also host headliners Kalandra and The Science of the Lamps over the festival weekend as well as choir for the homeless The Choir With No Name. Over at the Lomax on Friday you can be entertained by headliners Northampton based rock band Cousin Avi supported by the Mono LPs, and in the same venue on Saturday a vita force in Liverpool music culture The Amazing Kappa. Acoustic duo TJ & Murphy can be seen at The Lomax on Sunday. They have played support slots for top acoustic musicians such as Nick Harper and Stephen Fretwell, to name a few. They will be supported on the Sunday by Mersey Wylie, a Liverpool based singer-songwriter incorporating elements of soul, jazz and blues into her honest and rich self-penned songs. Also on the Saturday, ‘the peoples band’ Western Promise, fronted by political songwriter John McGlone, are back with a vengeance, headlining over at the Baltic Social and supported by The Jackobins, Steve Thompson and the Incidents and Stereo Electric Mistress. Whilst down at Lark Lane’s The Albert, Joe Symes and The Loving Kind will be supported by Southport lads Path Unknown. One of many highlights of the weekend will be Sunday 21st September at The Magnet, which will be hosting a night of class acts headlined by the mighty Alt-rock/Grunge band Black Seasons, closing the festival. Drawing influence from 90’s style grunge music, and old style rock ‘n’ roll, Black Seasons are a four piece currently based in Liverpool. Since their first gig in May 2013, the band has moved forward great strides, releasing their debut self titled EP in May 2014 and with their fan base growing rapidly having recently supported Twisted Wheel at Liverpool Calling. Black Seasons will be supported by alt-rock favourites Sugarking and Stillia amongst others. 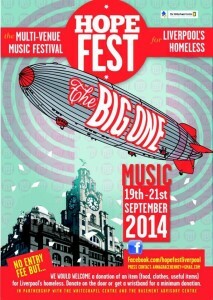 Full line up announcements, donations and wristband information can be seen at Facebook.com/HopeFestLiverpool. The organisers are currently looking for corporate sponsors to help with essential costs which the event will incur. If you are interested in sponsoring this amazing event and giving something back to the local community, please contact annagracehenney@gmail.com.